It is a well-known fact that good quality riding boots tend to be quite pricey. While this is okay when buying for yourself as you know these boots will last you for years if you look after them properly, when it comes to your child’s riding boots, it’s tempting to skip slightly on the quality as it’s inevitable that your child will outgrow them in a few months. However, it really is vitally important that you do not compromise on the quality of your child’s boots, mainly for safety purposes. Good quality riding boots are an essential part of safe riding. 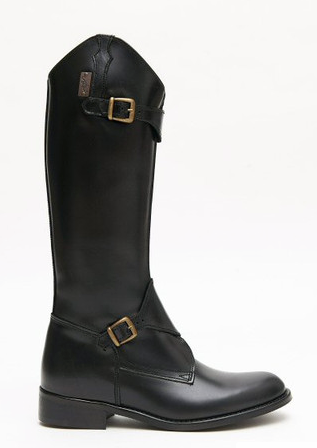 Along with a good quality hat, body protector and jodhpurs, you need good riding boots. Not only must you ensure that the boots you buy your children are proper riding boots (as opposed to snow boots, wellies or anything else) but you must ensure they are good quality boots with a heel at least one inch high to stop the foot slipping through the stirrup and and textured to sole to also help prevent this. Another big risk with not wearing proper, good quality riding boots is that you don’t just wear these boots when sitting on the horse, a safe distance away from their heavy hooves. When you’re on the ground, you constantly run the risk of having your feet trodden on by these beautiful beasts who don’t much care for your toes. Whether you’re just at the stable waiting for a lesson, mucking out your own pony or simply walking him to the field, it is so important to have your feet protected at all times. Leather is the best quality material option for your child’s riding boot rather than synthetic leather or cotton canvas. The leather will mold better to the foot creating more comfort and will be sturdier and more resistant than other materials. While ankle-high riding boots are cheaper and do provide a sturdy heel and good textured sole (if bought from a good place), the boots that go over the calf are better. Not only are they safer for your child and will stop any pinching from the saddle or any other injury to the lower part of the leg when riding out on a hack, they will help your child with their riding due to the stronger force behind them when kicking or trying to control the horse through their legs - it will make them a little stronger which can be useful for smaller children. In a range of different colors, these fantastically sturdy boots are well worth the investment. With a textured sole, decent size heel and exceptional quality leather, these are a truly fantastic buy.